Another back catalogue classic from 1993, this is Asher's top-selling album of all so far. Entirely instrumental and largely improvised, the album took just three days to record... from conception to completion! Inspired by both journeying along the pilgrimage route to Santiago de Compostella, and also by being present at the death of his Godfather after a long illness, this album successfully combines the sublime with the mournful and the angelic. The piano is played as a spontaneous expression of the heart, and is then orchestrated in the studio. The music and the iconic artwork somehow introduce a vibration from a different dimension altogether. Asher Quinn’s contributions to new age music began in the 1980’s. A U.K.-native and Jungian psychotherapist, Asher re-releases Concert of Angels for 2010. Previously produced in 1993, Concert of Angels’ popularity became one of the most popular releases out of seventeen different albums produced from 1987 to 2010. Concert of Angels is a spiritual and wholly instrumental release inspired by a number of influences and events, including Spain’s spiritual past, an illness, and a single line in a book. The opening 'Santiago' is a fifteen-minute romp through piano ecstasy. Inspired by a Spanish pilgrimage to Santiago de Compostella, 'Santiago' is an instrumental composition with little in the way of additional instrumentation. This is easily the best song on the album. The melodies and sounds are delicately slow and calculated to perfection, albeit heavenly. Bearing a resemblance to Enya’s quieter works, 'Santiago' still retains a solemn uniqueness for a wedding service or as a song at the end of an emotional film. The length is not a concern, as the song’s melody is varied and almost meditative. The second track, 'Angels Tending', is a symphonic and instrumental gem with keyboards, recorder, guitar, and E-bow. Running over six-and-a-half-minutes, 'Angels Tending' is the shortest song on the album. Despite the short length, the song fulfils every expectation by being symphonic, intriguing, and mysterious. The song was inspired by the death of Asher’s Godfather. 'Star Child' is another song devoted to Asher’s Godfather. A mostly piano-led piece, 'Star Child' also includes a little guitar work mostly in the background, but only in a few scattered locations. As with the other songs, 'Star Child' is also an instrumental song. The piano and recorder sounds meld perfectly with the emotive attributes of the song. The eight-minute song is not too short or too long. The catchy, almost Celtic-derived 'Sailing on the Silk Blue Sea', is a crystalline anthem on guitar, recorder, and keyboard. The song is inspired by a line in the book The House of the Spirits by Isabelle Allende, who was the wife of a former-Chilean president. The eight-and-a-half-minute song borders on heavenly brilliance with all the right sounds and moods coming together in one glorious, instrumental song. As the title suggests, the song would be ideal for sailing, as it is smooth as silk, too. There are no qualms about it. The final song, 'Lionel’s Song', is a nearly seven-minute composition on piano, guitar, recorder, and keyboards. The symphonic and instrumental build-up of the song is a fitting ending to the album. There are lush sounds, sweet melodies, and a catchy rhythm that sneaks up on the listener. As with the other songs, 'Lionel’s Song' is a perfect song for a film of hope, love, and contemplation. 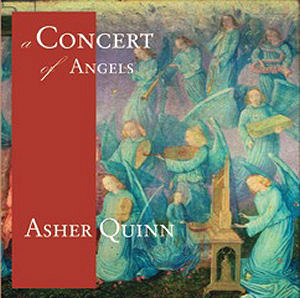 Overall, Asher’s Concert of Angels is a work of spiritual delight that transcends space, time, and place. The relatively few compositions do not short-change the listener, as the total running length is around forty-five minutes. The inspiration for the songs developed out of personal convictions and situations that only added to the brevity of the songs’ meanings, despite the absence of any vocalisations. The completely instrumental theme is certainly the most appealing to fans of new age music, spiritual music, and even classical. The cultural or ethnic influence of the songs was not especially distinct or identifiable. For instance, the instruments used were not played in a manner to identify a specific musical style or regional influences. Furthermore, the piano, recorder, keyboards, and guitar, are culturally ambiguous. Perhaps the music was divinely-inspired without regard for specific styles. At any rate, Concert of Angels is a glowing album of talent and musical achievement without any problems or mis-steps. In late January I lost my favourite dog, Dynah. A week or so before her passing I had purchased a copy of Concert of Angels. I was drawn to the selection 'Angels tending', and thought it was an appropriate piece to go with a YouTube tribute to Dynah. I did not want to upload it without permission. If you saw the presentation you would agree that the music is perfect. I work with children with disabilities, transporting them to and from school. We listen to Concert of Angels in the minibus along with many other of your albums which produce a gentle ambience, particularly after stressful days. Last saturday I wrote a review of Concert of Angels for Amazon and I gave it 5 stars. I wrote: "Concert of Angels is a very soothing and relaxing CD. It is just the type of music to help you unwind after a very busy day. I would recommend this CD to everyone who already knows Asha's music, and those who may not have heard it but need some calmness in their lives." I like Concert of Angels very much and find it both soothing and uplifting. Referring to Zoroastrianism in ancient Babylon, mention is made of 7 angels... one 'Ashi the Good', is the angel of blessings, she being the feminine form of Asha, who is truth, justice, virtue, holiness, cosmic law and order. Thought you might be interested to know this! Dear Asha Quinn, having recently acquired Concert of Angels I feel compelled to write to you. Your music is like a ray of hope to me. You must be touched by, if not inspired by, the very angels themselves. My purpose in writing (as an unimportant 81-year-old) is to say how much your music has meant (and does mean) to me. I never fail to respond to the delicacy and exceptional beauty of it. Thank you so much for Concert of Angels in particular. Dear Asha, I feel moved to write to you about how your music has touched people, and where it has gone. I own a small metaphysical music & book store in Des Moines, Iowa, the heart of the midwestern USA. We are not famous for being particularly cosmopolitan, just "good folks". I love your music and have sold Concert of Angels for over a year. Today, through the Council of International Understanding, I had a visitor from Uzbekistan. He asked for some meditation music and I chose Concert of Angels and several others, and played the demos. Yours was the only one he would have, and I could feel his energy-body settle down and reassemble into peace as he listened to it. I really love Concert of Angels and in particular 'Santiago'. I wonder, is the printed score available? I would love to be able to play it, it's so beautiful.